Amelia Earhart is a name many have heard in the classroom and beyond. Amelia Earhart’s flying career began in Los Angeles in 1921 when, at age 24, she took flying lessons and bought her first airplane – a Kinner Airstar. Photo courtesy of the National Archives via http://coastguard.dodlive.mil. A pioneer of American aviation, Earhart set off for her transatlantic solo flight on the morning of May 20, 1932. She flew from Newfoundland and landed in Ireland in under 15 hours the next day. 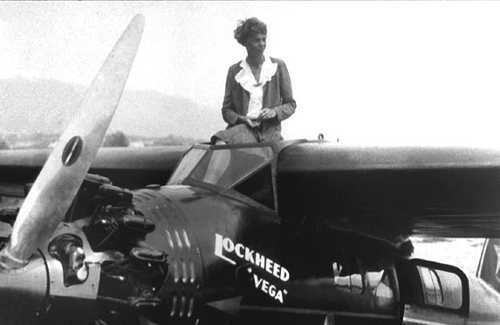 Earhart traveled over 2,000 miles in a Lockheed Vega 5B during the trip. Although she wasn’t the first — American aviator Charles Lindbergh became the first pilot to accomplish the nonstop flight across the Atlantic Ocean in 1927 — she became the first woman to fly solo nonstop across the Atlantic. For this record, Earhart received the Distinguished Flying Cross from Congress. Her next solo flight occurred on Jan. 11, 1935, when Earhart became the first person to fly solo from Honolulu, Hawaii to Oakland, Calif.